Some say that Bandon has the nicest, most unspoiled stretch of beach on the entire Oregon Coast. That's some claim on such a beautiful coast, but one that's hard to argue with. The harbor stands at the mouth of the Coquille River and is famous for its now retired Lighthouse. The coast provides many simple pleasure activities include beachcombing, hiking, fishing and crabbing from the docks. 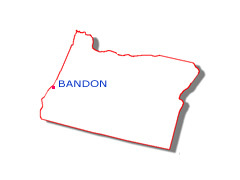 Originally a logging and fishing center, Bandon has turned to tourism as its main source of revenue. The Old Town has a special charm about it and has become a shoppers paradise with its large array of galleries, craft stores and fresh seafood restaurants. Known as the Cranberry Capital, Bandon hosts the annual Cranberry Festival each September. Needless to say, you can find every form of Cranberry confection here in the town! Other attractions include Bandon Dunes Golf Course and the West Coast Game Park situated about 7 miles south of the town.